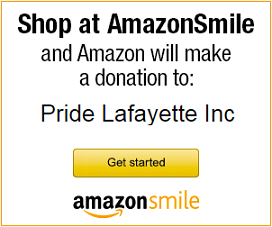 Events – Pride Lafayette, Inc. Celebrate Thanksgiving with Pride Lafayette! The Community Center will be open 5PM-9PM and will serve a free Thanksgiving dinner. All are welcome; feel free to bring your signature dish to share! Visit the Event Page for the latest updates! 03/29: Now that it’s legal, should you? The Community Center will be closed tonight (February 1) in accordance with our Severe Weather Policy; Trans* Lafayette’s meeting is also canceled. Stay safe and stay warm! Planning for our annual Volunteer Appreciation Picnic is underway! Keep an eye on our website and Facebook page for event details which will be posted soon. From Trans*Lafayette: We are meeting 4:30pm-6pm at Pride (640 Main st. In Lafayette) to discuss coming out, not coming out, safety during coming out, or anything else anyone is interested in discussing. Skye will host Pride from 6-8pm so we can keep hanging out. Looking forward to seeing everyone there! July 6: Trans* Lafayette Meets Tonight! Help Needed at the Taste! Indigo Girls Coming to Lafayette!